Dot matrix: A type of impact printer that produces characters and illustrations by striking pins against an ink ribbon to print closely spaced dots in the appropriate shape. Dot-matrix printers are relatively expensive and do not produce high-quality output. However, they can print to multi-page forms (that is, carbon copies), something laser and ink-jet printers cannot do. Speed: Given in characters per second (cps), the speed can vary from about 50 to over 500 cps. Most dot-matrix printers offer different speeds depending on the quality of print desired. Print quality: Determined by the number of pins (the mechanisms that print the dots), it can vary from 9, 18 or 24pins. The best dot-matrix printers (24 pins) can produce near letter-quality type, although you can still see a difference if you look closely. In addition to these characteristics, you should also consider the noise factor. 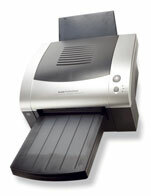 Compared to laser and ink-jet printers, dot-matrix printers are notorious for making a lot of noise. Ink-jet: A type of printer that works by spraying ionized ink at a sheet of paper. Magnetized plates in the ink's path direct the ink onto the paper in the desired shapes. Ink-jet printers are capable of producing high quality print approaching that produced by laser printers. A typical ink-jet printer provides a resolution of 600 dots per inch, although some newer models offer higher resolutions. Speed: Given in Pages per Minute (PPM) the higher the PPM the more pages they can print. Most ink-jet printers offer different speeds depending on the quality of print desired. Print quality: Determined by the DPI Dot Per Inch Example 2440 x 1220 DPI (Vertical and Horizontal DPI) The higher the DPI the better in terms of print quality. 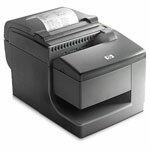 In general, the price of ink-jet printers is lower than that of laser printers. However, they are also considerably slower. Another drawback of ink-jet printers is that they require a special type of ink that is apt to smudge on inexpensive copier paper. Because ink-jet printers require smaller mechanical parts than laser printers, they are especially popular as portable printers. In addition, color ink-jet printers provide an inexpensive way to print full-color documents. Laser: A type of printer that utilizes a laser beam to produce an image on a drum. The light of the laser alters the electrical charge on the drum wherever it hits. The drum is then rolled through a reservoir of toner, which is picked up by the charged portions of the drum. Finally, the toner is transferred to the paper through a combination of heat and pressure. This is also the way copy machines work. Because an entire page is transmitted to a drum before the toner is applied, laser printers are sometimes called page printers. There are two other types of page printers that fall under the category of laser printers even though they do not use lasers at all. One uses an array of LEDs to expose the drum, and the other uses LCD's. Once the drum is charged, however, they both operate like a real laser printer. One of the chief characteristics of laser printers is their resolution -- how many dots per inch (dpi) they lay down. The available resolutions range from 300 dpi at the low end to 1,200 dpi at the high end. By comparison, offset printing usually prints at 1,200 or 2,400 dpi. Some laser printers achieve higher resolutions with special techniques known generally as resolution enhancement. In addition to the standard monochrome laser printer, which uses a single toner, there also exist color laser printers that use four toners to print in full color. Color laser printers tend to be about five to ten times as expensive as their monochrome siblings. Font cartridges: Laser printers have slots in which you can insert font cartridges, ROM boards on which fonts have been recorded. The advantage of font cartridges is that they use none of the printer's memory. Soft fonts: All laser printers come with a certain amount of RAM memory, and you can usually increase the amount of memory by adding memory boards in the printer's expansion slots. You can then copy fonts from a disk to the printer's RAM. This is called downloading fonts. A font that has been downloaded is often referred to as a soft font, to distinguish it from the hard fonts available on font cartridges. The more RAM a printer has, the more fonts that can be downloaded at one time. In addition to text, laser printers are very adept at printing graphics. However, you need significant amounts of memory in the printer to print high-resolution graphics. To print a full-page graphic at 300 dpi, for example, you need at least 1 MB (megabyte) of printer RAM. For a 600-dpi graphic, you need at least 4 MB RAM. Because laser printers are no impact printers, they are much quieter than dot matrix. They are also relatively fast, although not as fast as some dot-matrix printers. 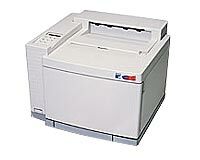 The speed of laser printers ranges from about 4 to 20 pages of text per minute (ppm). A typical rate of 6 ppm is equivalent to about 40 characters per second (cps). PCL: Hewlett-Packard (HP) was one of the pioneers of laser printers and has developed a Printer Control Language (PCL) to control output. There are several versions of PCL, so a printer may be compatible with one but not another. In addition, many printers that claim compatibility cannot accept HP font cartridges. PostScript: This is the de facto standard for Apple Macintosh printers and for all desktop publishing systems. Most software can print using either of this PDL's. PostScript tends to be a bit more expensive, but it has some features that PCL lacks and it is the standard for desktop publishing. Some printers support both PCL and PostScript. Photo Printer – Is a type of printer use for printing photographs. Dye-Sublimation Printer – Is a type of printer which employs a printing process that uses heat to transfer dye to a medium such as a plastic card, printer paper or poster paper. Thermal Printer- Is a type of printer that produces a printed image by selectively heating coated thermo chromic paper, or thermal paper as it is commonly known, when the paper passes over the thermal print head. The coating turns black in the areas where it is heated which then produce an image. USB – Standard USB Printer Cable speed is around 12Mbps. Network, or commonly Ethernet, connections are commonplace on network laser printers, though some other types of printers do employ this type of connection. Generally, network printers are designed to be shared using a central file/print server, though you can share them off a workstation in a “workgroup” environment. 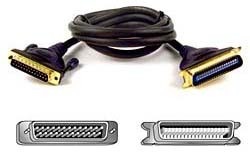 Parallel is the original standard for printers and a lot of basic printers still rely on the parallel port connection. A parallel (also called LPT port) sends and receives data simultaneously, transmitting data in parallel. Parallel uses a DB25 connection on the computer side and an oddly shaped 36 pin connection on the printer called the centronics port. USB, or Universal Serial Bus, is a very common connector type for personal printers being sold today. USB is sold as the next generation of standard ports for computers. USB allows mice, keyboards, scanners, printers, most peripherals to connect to a computer. It supports up to 12 Mbps transfer rate and is hot swappable. Infrared is not very commonly used. An Infrared acceptor allows your devices (laptops, PDAs, Cameras, etc) connect to the printer and send print commands via infrared signals. Serial allows your printer to connect to your computer via the serial port. Firewire is a high speed connection commonly referred to as IEEE1394, its “standard”. Though not specifically mentioned in the preparation outline for the exam, you should be aware that a printer may connect via Firewire. Firewire is a high speed connection typically used for digital video editing or other high bandwidth requirements. An HP Jet direct (or Printer Server Box) is a device which allows a non-networkable printer to be networked. For example, we have an Epson color inkjet printer in our office which has a standard parallel port connection on it. The Jet Direct box allows the printer to be connected into our network and allows the printer to be shared off of our file/print server. The most common barcode printers employ one of two different printing technologies. Direct thermal printers use a printhead to generate heat that causes a chemical reaction in specially designed paper that turns the paper black. Thermal transfer printers also use heat, but instead of reacting the paper, the heat melts a waxy or resin substance on a ribbon that runs over the label or tag material. The heat transfers ink from the ribbon to the paper. Direct thermal printers are generally less expensive, but they produce labels that can become illegible if exposed to heat, direct sunlight, or chemical vapors. Datamax-O’Neil offers a broad range of Industrial Barcode Printers for a variety of applications and duty cycles to meet the needs of many industries. Our world class printers cover a broad range of printing solutions from customers printing less than 4000 labels per day to 24/7 mission critical printing needs. Dot matrix printing or impact matrix printing is a type of computer printing which uses a print head that runs back and forth, or in an up and down motion, on the page and prints by impact, striking an ink-soaked cloth ribbon against the paper, much like the print mechanism on a typewriter. However, unlike a typewriter or daisy wheel printer, letters are drawn out of a dot matrix, and thus, varied fonts and arbitrary graphics can be produced. Each dot is produced by a tiny metal rod, also called a "wire" or "pin", which is driven forward by the power of a tiny electromagnet or solenoid, either directly or through small levers (pawls). Facing the ribbon and the paper is a small guide plate pierced with holes to serve as guides for the pins. This plate may be made of hard plastic or an artificial jewel such as sapphire or ruby. The common serial dot matrix printers use a horizontally moving print head. The print head can be thought of featuring a single vertical column of seven or more pins approximately the height of a character box. In reality, the pins are arranged in up to four vertically or/and horizontally slightly displaced columns in order to increase the dot density and print speed through interleaving without causing the pins to jam. Thereby, up to 48 pins can be used to form the characters of a line while the print head moves horizontally. In a considerably different configuration, so called line dot matrix printers use a fixed print head almost as wide as the paper path utilizing a horizontal line of thousands of pins for printing. Sometimes two horizontally slightly displaced rows are used to improve the effective dot density through interleaving. While still line-oriented, these printers for the professional heavy-duty market effectively print a whole line at once while the paper moves forward below the print head. The printing speed of serial dot matrix printers with moving heads varies from 50 to 550 cps. In contrast to this, line matrix printers are capable of printing much more than 1000 cps, resulting in a throughput of up to 800 pages/hour. Because the printing involves mechanical pressure, both of these types of printers can create carbon copies and carbonless copies. These machines can be highly durable. When they do wear out, it is generally due to ink invading the guide plate of the print head, causing grit to adhere to it; this grit slowly causes the channels in the guide plate to wear from circles into ovals or slots, providing less and less accurate guidance to the printing wires. Eventually, even with tungsten blocks and titanium pawls, the printing becomes too unclear to read. Although nearly all inkjet, thermal, and laser printers also print closely spaced dots rather than continuous lines or characters, it is not customary to call them dot matrix printers. The LA30 was a 30 character/second dot matrix printer introduced in 1970 by Digital Equipment Corporation of Maynard, Massachusetts. It printed 80 columns of uppercase-only 5x7 dot matrix characters across a unique-sized paper. The printhead was driven by a stepper motor and the paper was advanced by a somewhat-unreliable and definitely noisy solenoid ratchet drive. The LA30 was available with both a parallel interface and a serial interface; however, the serial LA30 required the use of fill characters during the carriage-return operation. The LA30 was followed in 1974 by the LA36, which achieved far greater commercial success, becoming for a time the standard dot matrix computer terminal. The LA36 used the same print head as the LA30 but could print on forms of any width up to 132 columns of mixed-case output on standard green bar fanfold paper. The carriage was moved by a much-more-capable servo drive using a DC electric motor and an optical encoder / tachometer. The paper was moved by a stepper motor. The LA36 was only available with a serial interface but unlike the earlier LA30, no fill characters were required. This was possible because, while the printer never communicated at faster than 30 characters per second, the mechanism was actually capable of printing at 60 characters per second. During the carriage return period, characters were buffered for subsequent printing at full speed during a catch-up period. The two-tone buzz produced by 60 character-per-second catch-up printing followed by 30 character-per-second ordinary printing was a distinctive feature of the LA36. In 1970, Centronics (then of Hudson, New Hampshire) introduced a dot matrix printer, the Centronics 101. The search for a reliable printer mechanism led it to develop a relationship with Brother Industries, Ltd of Japan, and the sale of Centronics-badged Brother printer mechanisms equipped with a Centronics print head and Centronics electronics. Unlike Digital, Centronics concentrated on the low-end line printer marketplace with their distinctive units. In the process, they designed the parallel electrical interface that was to become standard on most printers until it began to be replaced by the Universal Serial Bus (USB) in the late 1990s. The printer head is attached to a metal bar that ensures correct alignment, but horizontal positioning is controlled by a rubber band that attaches to sprockets on two wheels at each side which is then driven with an electric motor. Actual position can be found out either by dead count using a stepper motor, rotary encoder attached to one wheel or a transparent plastic band with markings that is read by an optical sensor on the printer head (common on inkjets). In the 1970s and 1980s, dot matrix impact printers were generally considered the best combination of expense and versatility, and until the 1990s they were by far the most common form of printer used with personal and home computers. The Epson MX-80, introduced in 1979, was the groundbreaking model that sparked the initial popularity of impact printers in the personal computer market. The MX-80 combined affordability with good-quality text output (for its time). Early impact printers (including the MX) were notoriously loud during operation, a result of the hammer-like mechanism in the print head. The MX-80 even inspired the name of a noise rock band. The MX-80's low dot density (60dpi horizontal, 72dpi vertical) produced printouts of a distinctive "computerized" quality. When compared to the crisp typewriter quality of a daisy-wheel printer, the dot-matrix printer's legibility appeared especially bad. In office applications, output quality was a serious issue, as the dot-matrix text's readability would rapidly degrade with each photocopy generation. IBM sold the MX-80 as IBM 5125. Initially, third-party software (such as the Bradford printer enhancement program) offered a quick fix to the quality issue. The software utilized a variety of software techniques to increase print quality; general strategies were doublestrike (print each line twice), and double-density mode (slow the print head to allow denser and more precise dot placement). Such add-on software was inconvenient to use, because it required the user to remember to run the enhancement program before each printer session (to activate the enhancement mode). Furthermore, not all enhancement software was compatible with all programs. Early personal computer software focused on the processing of text, but as graphics displays became ubiquitous throughout the personal computer world, users wanted to print both text and images. Ironically, whereas the daisy-wheel printer and pen-plotter struggled to reproduce bitmap images, the first dot-matrix impact printers (including the MX-80) lacked the ability to print graphics. Yet the dot-matrix print head was well-suited to this task, and the capability, referred to as "dot-addressable" quickly became a standard feature on all dot-matrix printers intended for the personal and home computer markets. In 1981, Epson offered a retrofit EPROM kit called GrafTrax to add the capability to many early MX series printers. Banners and signs produced with software that used this ability, such as Broderbund's Print Shop, became ubiquitous in offices and schools throughout the 1980s. Progressive hardware improvements to impact printers boosted the carriage speed, added more (typeface) font options, increased the dot density (from 60dpi up to 240dpi), and added pseudo-color printing. Faster carriage speeds meant faster (and sometimes louder) printing. Additional typefaces allowed the user to vary the text appearance of printouts. Proportional-spaced fonts allowed the printer to imitate the non-uniform character widths of a typesetter. Increased dot density allowed for more detailed, darker printouts. The impact pins of the printhead were constrained to a minimum size (for structural durability), and dot densities above 100dpi merely caused adjacent dots to overlap. While the pin diameter placed a lower limit on the smallest reproducible graphic detail, manufacturers were able to use higher dot density to great effect in improving text quality. Single-strike and Multi-strike ribbons were an attempt to address issues in the ribbon's ink quality. Standard printer ribbons used the same principles as typewriter ribbons. The printer would be at its darkest with a newly installed ribbon cartridge, but would gradually grow fainter with each successive printout. The variation in darkness over the ribbon cartridge's lifetime prompted the introduction of alternative ribbon formulations. Single-strike ribbons used a carbon-like substance in typewriter ribbons transfer. As the ribbon was only usable for a single loop (rated in terms of 'character count'), the blackness was of consistent, outstanding darkness. Multi-strike ribbons gave an increase in ribbon life, at the expense of quality. At least 50% and up to 99.9% of the given ribbon surface would be wasted per character, since an entire fresh new region of ribbon was needed to print even the smallest font shapes. Ribbon advance was fixed to always span the largest character shape, so a row of periods would consume as much fresh ribbon as a row of W's, with a large span of unused carbon between each dot. Single-strike ribbons created a risk of espionage and loss of privacy, because the used ribbon reel could be unwound to reveal everything that had been printed. Secure disposal was required by shredding, melting, or burning of used ribbon cartridges to prevent recovery of information from garbage bins. Several manufacturers implemented color dot-matrix impact printing through a multi-color ribbon. Color was achieved through a multi-pass composite printing process. During each pass, the print head struck a different section of the ribbon (one primary color.) For a 4-color ribbon, each printed line of output required a total of 4 passes. In some color printers, such as the Apple ImageWriter II, the printer moved the ribbon relative to the fixed print head assembly. In other models, the print head was tilted against a stationary ribbon. Text quality was a recurring issue with dot-matrix printers. Near Letter Quality mode—informally specified as almost good enough to be used in a business letter—endowed dot-matrix printers with a simulated typewriter-like quality. By using multiple passes of the carriage, and higher dot density, the printer could increase the effective resolution. For example, the Epson FX-86 could achieve a theoretical addressable dot-grid of 240 by 216 dots/inch using a print head with a vertical dot density of only 72 dots/inch, by making multiple passes of the print head for each line. For 240 by 144 dots/inch, the print head would make one pass, printing 240 by 72 dots/inch, then the printer would advance the paper by half of the vertical dot pitch (1/144 inch), then the print head would make a second pass. For 240 by 216 dots/inch, the print head would make three passes with smaller paper movement (1/3 vertical dot pitch, or 1/216 inch) between the passes. To cut hardware costs, some manufacturers merely used a double strike (doubly printing each line) to increase the printed text's boldness, resulting in bolder but still jagged text. In all cases, NLQ mode incurred a severe speed penalty. Not surprisingly, all printers retained one or more 'draft' modes for high-speed printing. NLQ became a standard feature on all dot-matrix printers. While NLQ was well received in the IBM PC market, the Apple Macintosh market did not use NLQ mode at all, as it did not rely on the printer's own fonts. Mac word-processing applications used fonts stored in the computer. For non-PostScript (raster) printers, the final raster image was produced by the computer and sent to the printer, which meant dot-matrix printers on the Mac platform exclusively used raster ("graphics") printing mode. For near-letter-quality output, the Mac would simply double the resolution used by the printer, to 144 dpi, and use a screen font twice the point size desired. Since the Mac's screen resolution (72 dpi) was exactly half of the ImageWriter's maximum, this worked perfectly, creating text at exactly the desired size. Due to the extremely precise alignment required for dot alignment between NLQ passes, typically the paper needed to be held somewhat taut in the tractor feed sprockets, and the continuous paper stack must perfectly aligned behind or below the printer. Loosely held paper or skewed supply paper could cause misalignments between passes, rendering the NLQ text illegible. By the mid-1980s, manufacturers had increased the pincount of the impact printhead from 7, 8, 9 or 12 pins to 18, 24, 27 or 48, with 24 pins being most common. The increased pin-count permitted superior print-quality which was necessary for success in Asian markets to print legible CJK characters. In the PC market, nearly all 9-pin printers printed at a defacto-standard vertical pitch of 9/72 inch (per printhead pass, i.e. 8 lpi). Epson's 24-pin LQ-series rose to become the new de facto standard, at 24/180 inch (per pass - 7.5 lpi). Not only could a 24-pin printer lay down a denser dot-pattern in a single-pass, it could simultaneously cover a larger area. Compared to the older 9-pin models, a new 24-pin impact printer not only produced better-looking NLQ text, it printed the page more quickly (largely due to the 24-pin's ability to print NLQ with a single pass). 24-pin printers repeated this feat in bitmap graphics mode, producing higher-quality graphics in reduced time. While the text-quality of a 24-pin was still visibly inferior to a true letter-quality printer—the daisy wheel or laser-printer, the typical 24-pin impact printer outpaced most daisy-wheel models. As manufacturing costs declined, 24-pin printers gradually replaced 9-pin printers. 24-pin printers reached a dot-density of 360x360 dpi, a marketing figure aimed at potential buyers of competing ink-jet and laser-printers. 24-pin NLQ fonts generally used a dot-density of 360x180, the highest allowable with single-pass printing. Multipass NLQ was abandoned, as most manufacturers felt the marginal quality improvement did not justify the tradeoff in speed. Most 24-pin printers offered 2 or more NLQ typefaces, but the rise of WYSIWYG software and GUI environments such as Microsoft Windows ended the usefulness of NLQ. The desktop impact printer was gradually replaced by the inkjet printer. When Hewlett-Packard's patents expired on steam-propelled photolithographically produced ink-jet heads,[when?] the inkjet mechanism became available to the printer industry. For applications that did not require impact (e.g., carbon-copy printing), the inkjet was superior in nearly all respects: comparatively quiet operation, faster print speed, and output quality almost as good as a laser printer. By the mid-1990s, inkjet technology had surpassed dot-matrix in the mainstream market. As of 2005, dot matrix impact technology remains in use in devices such as cash registers, ATMs, fire alarm systems, and many other point-of-sales terminals. Thermal printing is gradually supplanting them in these applications. 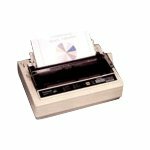 Full-size dot-matrix impact printers are still used to print multi-part stationery, for example at bank tellers and auto repair shops, and other applications where use of tractor feed paper is desirable such as data logging and aviation. Some are even fitted with USB interfaces as standard to aid connection to modern computers without legacy ports. Dot matrix printers are also more tolerant of the hot and dirty operating conditions found in many industrial settings. The simplicity and durability of the design, as well as its similarity to older typewriter technology, allows users who are not "computer literate" to easily perform routine tasks such as changing ribbons and correcting paper jams. Some companies, such as Printek, DASCOM, WeP Peripherals, Epson, Okidata, Olivetti, Lexmark, and TallyGenicom still produce serial and line printers. Today, a new dot matrix printer actually costs more than most inkjet printers and some entry level laser printers. However, not much should be read into this price difference as the printing costs for inkjet and laser printers are a great deal higher than for dot matrix printers, and the inkjet/laser printer manufacturers effectively use their monopoly over arbitrarily priced printer cartridges to subsidize the initial cost of the printer itself. Dot matrix ribbons are a commodity and are not monopolized by the printer manufacturers themselves. Dot matrix printers, like any impact printer, can print on multi-part stationery or make carbon-copies. Impact printers have one of the lowest printing costs per page. As the ink is running out, the printout gradually fades rather than suddenly stopping partway through a job. They are able to use continuous paper rather than requiring individual sheets, making them useful for data logging. They are good, reliable workhorses ideal for use in situations where printed content is more important than quality. The ink ribbon also does not easily dry out, including both the ribbon stored in the casing as well as the portion that is stretched in front of the print head; this unique property allows the dot-matrix printer to be used in environments where printer duty can be rare, for instance, as with a Fire Alarm Control Panel's output. Impact printers create noise when the pins or typeface strike the ribbon to the paper. Sound-damping enclosures may have to be used in quiet environments. They can only print lower-resolution graphics, with limited color performance, limited quality, and lower speeds compared to non-impact printers. While they support fanfold paper with tractor holes well, single-sheet paper may have to be wound in and aligned by hand, which is relatively time-consuming, or a sheet feeder may be utilized which can have a lower paper feed reliability. When printing labels on release paper, they are prone to paper jams when a print wire snags the leading edge of the label while printing at its very edge. For text-only labels (e.g., mailing labels), a daisy wheel printer or band printer may offer better print quality and a lesser chance of damaging the paper. The advantages are: low purchase cost, can handle multipart forms, cheap to operate, just new ribbons, rugged and low repair cost and the paper is completely connected. This allows to print long banners that span across several sheets of paper. The disadvantages are: noisy, low resolution. You can see the dots making up each character, not all can do color, color looks faded and streaky, slow and dot matrix printers are more prone to jamming, and their jams are more difficult to clear. This is because paper is fed in using two wheels and holes set into the paper. A small tear on the side of a sheet can create a jam and the bits of paper between the wheels make it tedious to fix.